Volunteers plant trees at Capitol Quarter. 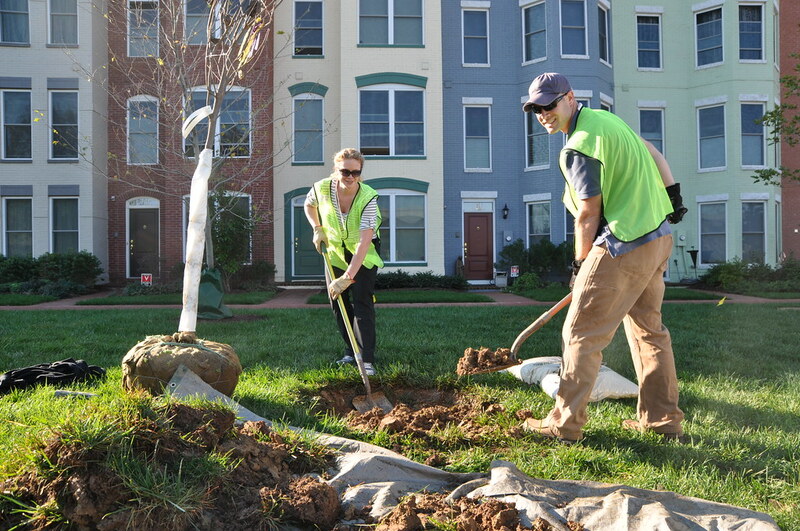 Apply for a Community Tree Planting event and join the hundreds of D.C. residents who have helped re-forest the city! Casey Trees is currently accepting applications for our spring CTP season. If your application is accepted, Casey Trees will provide and plant trees at your specified location for free. But hurry - the deadline for all applications is Nov. 30. Want to plant 10 or more trees at a location in D.C. (school sites can request fewer). Can obtain permission from all property owners to plant at the site. Are willing to attend an orientation meeting and agree to care for the trees for two years after the planting. Since its inception in 2005, the CTP program has helped put thousands of young trees in the ground. Casey Trees provides all the trees, tools and volunteers to make each CTP event a success. Remember, even if you can't apply for a CTP event, we still need your help! Consider making a donation or sponsoring a CTP event to help offset tree costs.